1834 Indenture system, an alternate source of labour for British Empire, first started with the labourers being sent to work in Mauritius, Uganda and Nigeria for an initial 5 year period. This system became widely known as "Girmit" - a mispronunciation of the word "agreement" by the non-English speaking Indian labourers. 1875 Fiji first Governor Arthur Gordon arrives. He has already served as Governor in Mauritius and Trinindad and has encountered indentured labourers. His preference for indentured labour as opposed to native labour stems from his unwillingness to employ native labour on the grounds that it will disrupt village life. 1879 First indentured labourers arrive in Fiji aboard the Leonidas. The ship set sail in Calcutta on March 03 and arrived in Fiji on May 14, with 373 male and 149 female labourers. Cholera, dysentery and smallpox were also onboard - 17 labourers had already succumbed to these diseases. 1882 Colonial Sugar Refining (CSR) company of Australia sets up its first sugar mill in Nausori. Second emigrant ship arrives in Fiji. Fiji's capital moved from Levuka to Suva. 1884 The fifth emigrant ship to Fiji, Syria was wrecked on the Nasilai reef, off Nausori on May 11 killing fifty six immigrants and three lascars (Indian sailors). First lot of labourers complete their five year contract. Sixty percent choose to remain in Fiji. 1908 Sizes of "Lines" in which the labourers are housed is changed from 10 feet by 7 feet to 10 feet by 12 feet. 1912 Legislation passed requiring employers of indentured labourers to provide school buildings. 1916 Indenture system is officially abolished by Britain. The last shipload of labourers arrive in November aboard the Sutlej V. This is the 87th ship that brought labourers to Fiji. Some 60, 553 labourers came to Fiji between 1879 and 1916. Before Fiji was ceded to Great Britain, some planters had tried to obtain Indian labour and had approached the British Consul in Levuka, Fiji but were met with a negative response. In 1870 a direct request by a planter to the Government of India was also turned down and in 1872, an official request by the Cakobau Government was informed that British rule in Fiji was a pre-condition for Indian emigration to Fiji. The early ancestors of Fijian Indians came from different regions and backgrounds from India and other neighboring countries. However, most came from rural villages in northern and western India. In January 1879, thirty-one Indians, who had originally been indentured labourers in Réunion, were brought from New Caledonia to Fiji under contract to work on a plantation in Taveuni. These labourers demonstrated knowledge of the terms of the indenture agreement and were aware of their rights and refused to do the heavy work assigned to them. Their contract was terminated by mutual agreement between the labourers and their employers. In 1881, thirty-eight more Indians arrived from New Caledonia and again most of them left but some stayed taking Indian wives or island women. The colonial authorities promoted the sugar cane industry, recognizing the need to establish a stable economic base for the colony, but were unwilling to exploit indigenous labour and threaten the Fijian way of life. The use of imported labour from the Solomon Islands and what is now Vanuatu generated protests in the United Kingdom, and the Governor Sir Arthur Hamilton-Gordon decided to implement the indentured labour scheme, which had existed in the British Empire since 1837. A recruiting office was set up in Calcutta, followed by another in Madras in 1902. These officers were used to recruit labourers under the impression that Fiji was just over the horizon when in fact it was 1000’s of kilometers away. A lot of people were kidnapped and brought over with false documents while some came under their own will. There were smaller numbers from Punjab, Kashmir, Haryana, and other parts of India. The contracts of the indentured labourers, which they called girmit (agreements), required them to work in Fiji for a period of five years. Living conditions on the sugar cane plantations, on which most of the girmityas (indentured labourers) worked, were often squalid. Hovels known as “coolie lines” dotted the landscape. Public outrage in the United Kingdom at such abuses was a factor in the decision to halt the scheme in 1916. After a further five years of work as an indentured labourer or as a khula (free labourer), they were given the choice of returning to India at the expense of the British government, or remaining in Fiji. The great majority opted to stay. After the expiry of their girmits, many leased small plots of land from Fijians and developed their own sugarcane fields or cattle farmlets. Others went into business in the towns that were beginning to spring up.The indenture system had two positive effects on subsequent generations. Firstly the need for people of different casts to live work and eat together led to an end of the caste system. Furthermore, shortage of females resulted in many marrying outside their caste. Another positive was the development of a new koiné language, known as Fiji Hindi formed from the Hindi dialects of Eastern Uttar Pradesh and Bihar (mainly Awadhi and Bhojpuri). 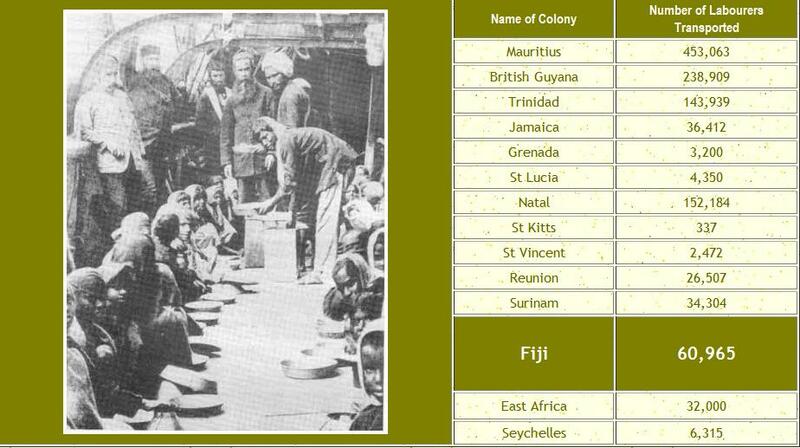 The language was further enriched by the inclusion of many Fijian and English words. The language is now the mother tongue of almost all Fiji Indians and is the lingua franca of not only all the Fiji Indians but also of all communities where ethnic Indians are in a majority. Girmit – A centenary Anthology 1879 – 1979, Suva, Fiji: Girmit Centenary Celebrations National Committee, 1979. Girmit: Its Significance in Fiji Ali, Ahmed, Kumar Printers PVT Limited New Delhi, India, 1979.